BECAUSE MY WORK IS MY PASSION I CAN GUARANTEE YOU THAT YOU WILL ENJOY THE COOPERATION WITH ME AND OFF COURSE THE FINAL RESULTS. CREATING NEW DESIGNS REPRESENTING YOU OR YOUR BRAND AND SPREADING THE SUCCESS THROUGH MY KNOWLEDGE I GATHERING FOR OVER A DECADE IS WHAT I ENJOY MOST. Starting a business or do you need to improve your current website? That’s great because I don’t create only a website, but I create a web platform which works for you with the design matching your brand image, programmatic systems behind to maximally increase your brand awareness and perfect SEO optimisation. The website from me is not just your presentation but it’s your partner who is transferring your visitors into your customers. If you looking for E-commerce solution you are in the right place, asking about future support? No problem. DO YOU HAVE ANY SERIOUS PLANS WITH YOUR BRAND? THEN NOW IS THE RIGHT TIME TO TALK ABOUT IT. I TAKE A BRANDING AS IMPORTANT PART OF YOUR BUSINESS AND TAKING ALL THE IMPORTANT PARTS INTO CONSIDERATION WHEN I CREATE YOUR BRAND IMAGE. Have you ever thought about your target market, ideal customer, the way they prefer to communicate with your brand, what they like and other crucial details, that can affect the success of your business? This is my day to day cup of tea. I enjoy spreading success around and now, you can be part of it. ARE YOU LOOKING FOR SOMETHING EXTRA TO SEPARATE YOURSELF FROM THE CROWD? BESIDE OF MY UNIQUE DESIGNS, I HAVE ONE SPECIALITY IN TERM OF THE BUSINESS CARD MATERIAL & DESIGN. Each logo design is created uniquely for your brand with my guarantee, so you can be sure that no other company will have the same logo design just with a different name. The design also fulfils all ® trademark requirements for your future registration needs. The final graphics are delivered in Vector graphics (fully scalable graphics without losing the image quality) and then exported to other required formats. Normally the design is delivered in a vector .pdf file with a guide on how to using the logo design, .png files with transparent background in 1500, 1000, 800, 600, 300, 150, 75 pixels wide and Ready Favicon for your website. The timeframe for the design delivery might vary as I am sometimes less or more busy. You can expect the final design sometimes between 3 to 10 days from the date I start working on the design, but please feel free to contact me for the actual details. Every project is unique so as my approach, for more accurate details please feel free to contact me here. Are you looking for a super catchy design for your poster/banner (in paper or online form)? The creativity is the only limit and I am not afraid of anything new just the opposite my work is my passion so I always trying something new with the latest design techniques using only the top tools on the market provided by the Adobe. Any size and design are possible, don’t hesitate to ask. *For printed banners with delivery to the requested address, there is an extra fee for print and delivery. The fee varies dependently on the material and amount of the sheets. As you can see I prefer to create always a special design. The thing is that I like to play with the special designs I create and the best part about it is that with the business cards and leaflets I have the freedom with the materials I can use. Besides many different types of paper, you can also request my favourite creative material which is the transparent foil allowing me to create really unique business cards. 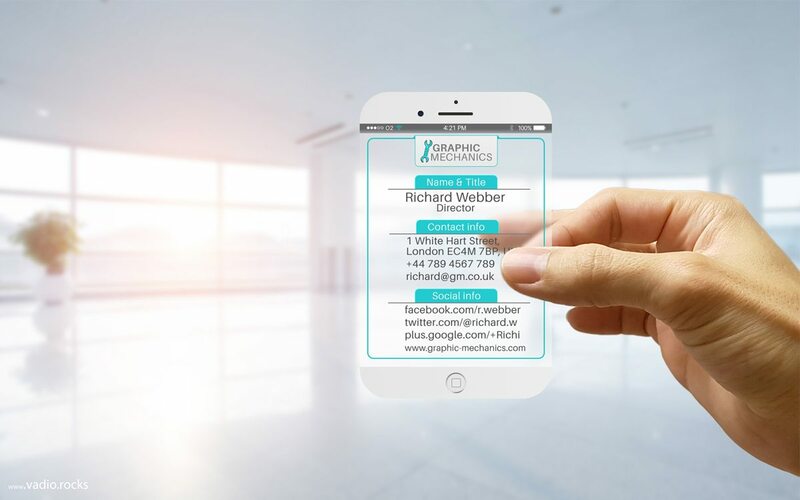 When you request the design you have an option to get only the design or you can have the real business cards delivered right to your address without any hassle. *For printed business cards with delivery to the requested address, there is an extra fee for print and delivery. The fee varies dependently on the material and amount of cards. In case you like to protect a little bit of the environment, I can create for you the virtual business card.You may wonder what is it? It’s simply an image created especially for your smartphone where the main part is a large QR code which will after the scan save the contact details directly into the contact list or it can be just photographed by another smartphone because the other contact details are for this case displayed as well. 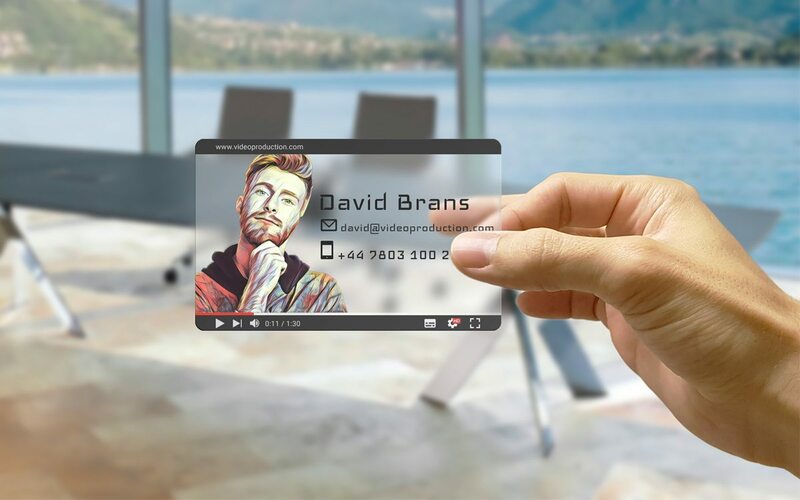 With this virtual business card, you can say goodbye to the classic ones. Price for the virtual business card is £30 with a delivery time of around 2 days. Showcase your speech and presentation in style with the Rollup banner designed by Vadio. Are you ready to order and then sit and relax? I really enjoy creating the websites so you can be sure that I always work my heart out on your project. All the websites I create are fully responsive and SEO optimised so you can be sure that your visitors will very easily browse through your website. I offer various packages of the website development so what features will be for your project the best. If you have future plans to scale your website that’s absolutely fine even when you choose the start development package. You can decide later on that you would like to start to write a blog, sell a products/services your time organise and sell events, have a membership on your website or much more and that’s not going to be an issue at all because all websites I create are just ready for whatever you scaling you need. Just choose one of my development packages and contact me to make your idea happen. Are you ready to get things moving? You can start with the starter package and order further development later on. After your successful order, I’ll be in touch with you shortly to discuss the details of your new website. Some People are thinking when the website is done that it doesn’t need any more attention. You can say that when you have your website as a presentation, but I wouldn’t agree with you on 100%. It’s simply because the website is like your business partner If you pay attention to him and take care of him he will work for you really well, unfortunately, the same is also in the opposite way. That’s why I offer the monthly maintenance offering you the website updates with edits matching the hour quota for each package. So you can relax and be sure that all on your website will work. or any crazy idea for a photo-edit to impress your followers than feel free to let me know so we can discuss your request further. Anything is possible. When you work on your new book you would like to get some attention before you publish it. People love to see what they will buy and that helps you from the marketing side to get more pre-orders. For the 3D Book Cover, I would request a design from you and then will transfer it to the 3D book. In case you would like me to create a book cover with a 3D book cover that’s possible too. Just get in touch so we can take it from there. and especially from our side to get an idea what type of design or work can suit you and your business best. During this step we agree on a time frame, budget and all your requirements, this is also sketch time so we will shape the idea as best we can to be ready to work on the main design work. We all know what to work on and what to expect, after this step you will see the final design, or you can request a revision of the work to have it as you wish. Your Satisfaction is our goal. After we finish your design and/or development, this step is intended for you to see it all in a flash. The finish line is close you can agree with the design or request the last edits. Exciting time for you and us. At this point, we will deliver you all the ready designs digital or printed (on your address), or in a case of a website, you will have brand new one ready to use with all the details by the hand. In a case of Website or App, you can ask us about ongoing support, which we are happy to provide.